Ty “SuperTy” Campbell was diagnosed with an atypical teratoid/rhabdoid tumor (AT/RT) in 2010, shortly before his third birthday. AT/RT is extremely rare and extremely lethal, with survival times measured only in months. Ty’s mother, Cindy, recalls his doctors telling her that with treatment they could give Ty one more good summer. 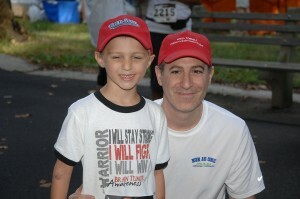 But time after time, little Ty defied the odds and beat all expectations – in the summer of 2012, two years after his diagnosis, he was one of the Race Ambassadors at a Miles for Hope 5K to benefit the Children’s Brain Tumor Project. The cancer reappeared later that fall and Team SuperTy turned out in force to show their support for him at the Rock’n’Roll Marathon’s 10K, joining scores of runners from Elizabeth’s Hope in a massive awareness event to get the word out about pediatric brain cancers. Ty lost his battle on October 17, 2012, just a few days after his fifth birthday. Cristian Rivera was diagnosed with DIPG in 2007, when he was just four years old. After his death in 2009, his parents started the Cristian Rivera Foundation in his memory and dedicated themselves to supporting pediatric brain tumor research. Every September, Cristian is honored at the annual Cristian Rivera Foundation Celebrity Gala, which has raised hundreds of thousands of dollars for Dr. Souweidane’s research. Jacob “Jake the Hero” Grecco of Phillipsburg, New Jersey, was diagnosed at age 7 with gliomatosis cerebri. His parents pursued every option for him, taking him to Germany for one last chance at treatment. When he died in August 2012 at age 8, Jake’s parents asked that, in lieu of flowers, supporters make donations to Elizabeth’s Hope and the Children’s Brain Tumor Project. We mourn Jake’s passing, as we mourn the senseless loss of all these beautiful children, and we join his family in our commitment to creating hope for future children facing these diagnoses. 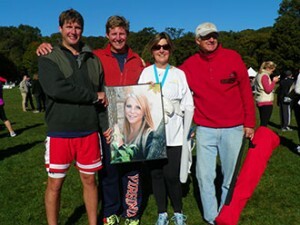 TEAM Sean has participated twice in the Miles for Hope 5K as well as in the 2012 Rock’n’Roll Marathon 10K. Sean Ries was diagnosed in February 2012 with a dysembryoplastic neuroepithelial tumor (DNET), a slow-growing glioma located close to his speech and motor centers. Originally told that the tumor’s location made it inoperable, the Ries family investigated every treatment possibility until they found Dr. Greenfield, who carefully mapped the tumor’s location and was able to remove 80% of the tumor in May. Sean started kindergarten in September, but he faces a lifetime of therapy, treatment, and monitoring for recurrence. One of the goals of the Children’s Brain Tumor Project is to find alternative treatments for children, to spare them the long-term consequences of harsh chemotherapy and radiation. Kathleen Clark lives in Homer, Louisiana, and found Elizabeth’s Hope as she was researching her father’s diagnosis of gliomatosis cerebri. Although the tumor is most commonly diagnosed in children and adolescents, it can occur in adults as well. Daryn Clark passed away in July 2012. Kathleen has become a passionate supporter of Elizabeth’s Hope and the Children’s Brain Tumor Project, holding fund-raisers and awareness events almost 1,500 miles away from where Elizabeth’s Hope was born. 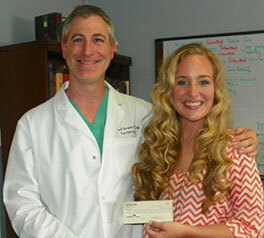 Kathleen recently paid a personal visit to Dr. Greenfield to deliver the contributions she’s collected. 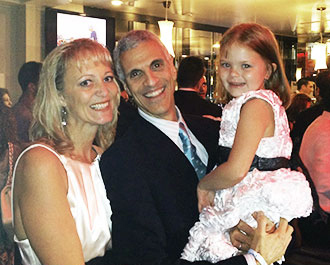 Caitlin Downing was diagnosed with DIPG in 2012, and thanks to the courage of her parents she became the very first patient to enroll in Dr. Mark Souweidane’s innovative clinical trial. Caitlin passed away in November 2012 at age five, and friends and supporters donated thousands of dollars to the Children’s Brain Tumor Project in her honor. We remain hopeful that this trial will provide much-needed data about the safety of convection-enhanced delivery (also called interstitial infusion), and we extend our sympathies to the Downing family. Fiona Lundell, known to those who loved her as Buggie, lost her battle with an anaplastic thalamic astrocytoma in June 2013 at the age of five. At the urging of her grandfather, friends and family members have donated thousands of dollars to help the Children’s Brain Tumor Project continue the research. Joshua Bembo turned 8 a week after being diagnosed with gliomatosis cerebri in 2011. Joshua’s motto: Calm Fearless Brave. This courageous boy and his family were all that and more during his long struggle, which ended in 2013. Joshua’s family is committed to the fight against pediatric brain tumors, and his aunt Evangeline is working with Dr. Greenfield to develop the first online international Gliomatosis Cerebri Registry. By facilitating the collection of tumor samples, the Registry will become a powerful weapon in this battle. It is only with the help of families like these — like ours — that the Children’s Brain Tumor Project can continue its work. Please consider joining the effort and be sure to follow The Children’s Brain Tumor Project on Facebook.